On the island of Merith, the Hansweighn holiday will begin at sundown. The people will feast in honor of the Chancellor’s victory over the magical races of Shallyghal. Unbeknownst to all, this Hansweighn brings a surprise: a vile peril has breached Merith’s Great Barrier and will soon enjoy its own dark feast. As the sun nears the horizon, adult cadets enter a test designed to remove the less devout prior to ascension into the Chancellor’s Army. Cord Sullivan worries it will reveal his curse, the magic hiding in his bones, a trait worthy of a fiery execution. Meanwhile, Rorry te Gwirion, a young noblewoman, plans to use the distractions of the holiday to escape Merith and a blackmail-enforced engagement. Only on the continent can she find her sister, whom her father sold into slavery. She and Kylan Nock, a young man interested in the wilder pursuits the seas have to offer—and perhaps a handsome dockhand or two, hope to convince their friend Scarlett Hywel to come along. Scarlett’s innate magic might unlock the secrets of Shallyghal, easing their flight to the continent. As demonic invaders and their cursed wolfkin rip across the heart of Merith and through its people, the young ones will need help to survive. But, who can they trust? A band of foreign mercenaries comprised of a flirt, a half-ogre cook, two Ukrestian monks, and a peculiar sorcerer? Or their mysterious prisoner? Born and raised in Arkansas, Wade Lewellyn-Hughes has always been a fan of “geeky” things. He collects action figures, binge plays video games, and watches new and old cartoons. In elementary school, he wrote his first "book" and never really stopped dreaming up new stories to tell. 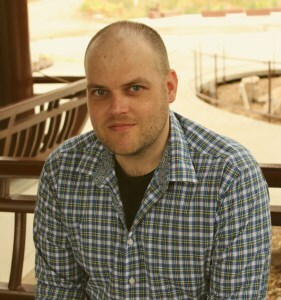 During his attendance at the University of Central Arkansas, he put some of the characters and ideas out there, but never took any serious steps toward publication because writing was not considered a viable career option. After graduating with his Bachelor's Degree, he moved to Seattle, Washington, and finally realized writing is his passion, financially responsible career options be damned. 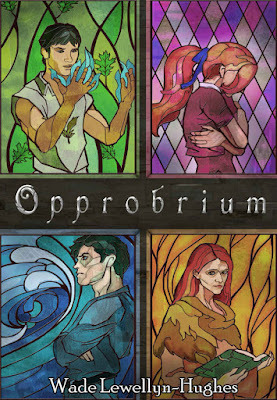 Using some of the characters in that tale from college, he began writing OPPROBRIUM, a fantasy adventure of friendship and discovery. With the full story laid out in his mind, Wade has committed to following the adventures of the characters from OPPROBRIUM through a series called the Lamentation's End. This will include seven novels and a series of novellas along the way that will detail backstories of secondary characters. Currently, he is writing one of those novellas, working his day job, and unpacking from his recent move from Los Angeles to Montana with his husband.